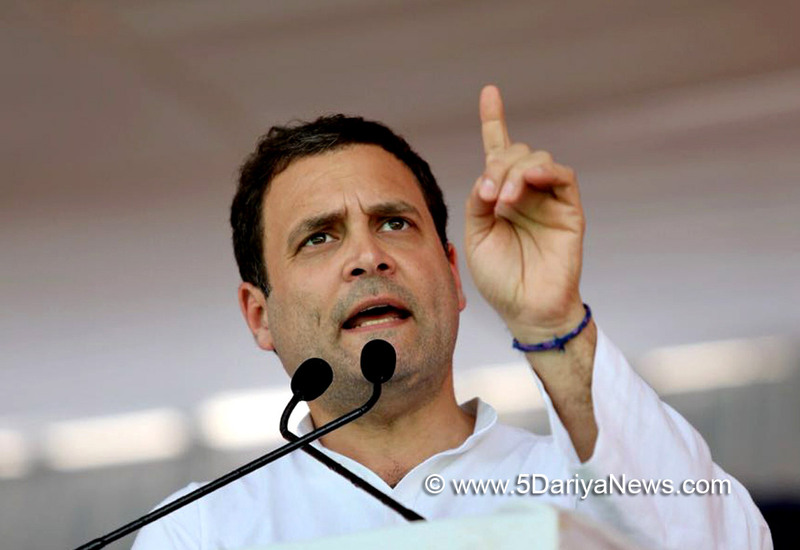 Congress President Rahul Gandhi on Friday targeted Prime Minister Narendra Modi for 50 per cent jump in Swiss bank deposits by Indians, saying he had promised to bring back all illegal money stashed abroad but his government was now virtually saying that there was no illegal money in Swiss banks.The Congress also questioned Modi on the rupee's falling value, which touched an all-time low to breach the Rs 69 per dollar mark on Thursday.In a tweet, Gandhi, referring to Interim Finance Minister Piyush Goyal's remarks earlier in the day about the latest data released by the Swiss National Bank that showed a rise in Indian deposits last year, said that the Modi government had carried out demonetization to supposedly curb black money but its stance now was totally different. "In 2014, he said: I will bring back all the 'BLACK' money in Swiss Banks and put Rs 15 lakh in each Indian bank account. In 2016, he said: Demonetisation will cure India of 'BLACK' money. In 2018, he says: 50 per cent jump in Swiss Bank deposits by Indians, is 'WHITE' money. No 'BLACK' (money) in Swiss banks!" the Congress chief said.Goyal, responding to a query about the data on rising Indian deposits last year in Switzerland, said 40 per cent of these were account of the Reserve Bank of India's Liberalised Remittance Scheme brought during the UPA government under which a resident Indian can remit $250,000 per year.He had however promised action if any wrongdoing is revealed, while noting due to various measures of the government, Indians' Swiss bank deposits have been decreasing. Attacking the government on the rupee's falling value, Congress spokesperson Randeep Singh Surjwewala said: "India's rupee weakening: $1 Rs 69.10; Promise was $1 Rs 40; Black money in Swiss banks increased by 50 per cent to Rs 7,000 crore. ""The promise was to bring back Rs 80 lakh crore in 100 days from foreign banks! Good days (achhe din) turned into 'Jumla'. Where are those days of truth," he said in tweets.Terming Modi's promise of bringing back all illegal money stashed abroad as a "jumla", another party spokesman R.P.N. Singh said that a jump in Swiss bank deposits by Indians happened only twice and that too under BJP government - in 2004 and 2018 - and the party will raise these issues in the Parliament and on the streets.He said the same questions were raised by Modi when UPA was in power, asking if the Prime Minister will reply to the same questions now.Noting the BJP promised that when in power, they would work towards bringing the rate of a dollar to Rs 40, he said: "Today, the entire nation is watching that the value of rupee in terms of dollar has touched almost Rs 70. For the first time in 70 years, the rupee has fallen to such a low and it has happened under the BJP government. "Recalling Modi, as Gujarat Chief Minister, used to make fun of then Prime Minister Manmohan Singh's age and compared it with the value of rupee in terms of dollar, he said: "Rupee is currently the worst performing currency in the world today. But, we shall not point fingers at the Prime Minister in this manner. "Attacking the government on the condition of the public sector banks, he said their non-performing assets, or bad loans, have gone up to Rs 10 lakh crore in four years and according to an RBI report, will go up to Rs 15 lakh crore. "Deposits in the saving accounts of banks have gone down by 7 per cent. People are losing their faith in banks," he also said.